They say women have high pain tolerance because of giving birth, wearing high heels, wearing girdle and tearing hair off at eyebrow, underarm and down there. But did you know that waxing dosen't have to be as painful as you imagine. It's just a matter of knowing where to go and what waxing method to be use. 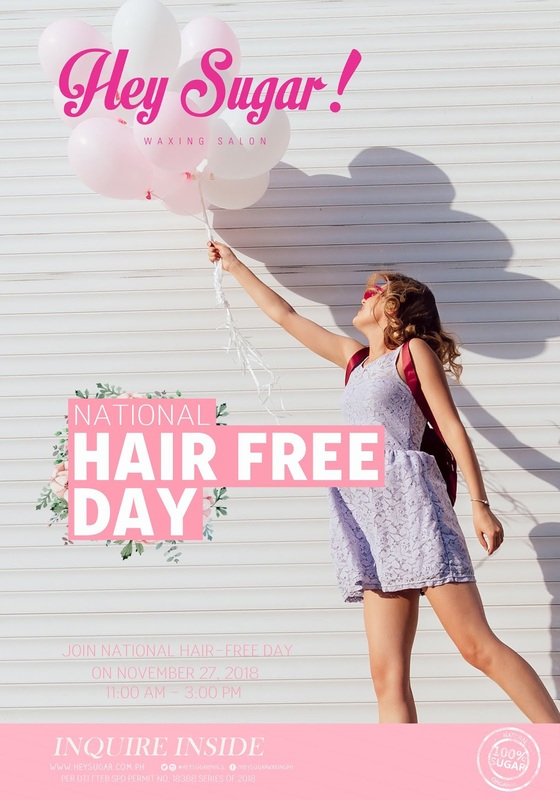 So Lovelies, in the spirit of this year's National Hair Free Day, Hey Sugar lets you experience nearly pain-free way of dealing with unwanted hair. Hey Sugar is known for using all-natural ingredients that is gentle to your skin. It begins by an expert aesthetician pouring the warm sugar wax on the area. This allow the mixture to really seep into your pores and get a good grip of hair follicles straight from the roots with moisturizing and exfoliating effect. They work in small, manageable method by pressing the skin gently as they lift the cooled wax efficiently that will remove even the shortest hair. After that, you emerge from the salon with smooth, exfoliated, moisturized and hair-free skin. The experience is clearly different from DIY creams and At-Home made kits which is messy and probably painful. Leading up to National Hair Free Dya, Hey Sugar will also be offering an incredible pampering treat for you. Visit your nearest Hey Sugar branch on November 27, 2018 arounf 11am to 3pm and get a free eyebrow threading and underarm waxing services. With that said, Do you really have to wonder if you should #SwitchToHeySugar ? 3rd level Abreeza Mall, J.P. Laurel Ave.